A-Wings - One Wing at a Time and A Bunch More!! A-Wings has been serving the Irondale and Metro area community and Greater Birmingham Alabama area with delicious hot wings since 2008, all in a warm and inviting environment. We were the first restaurant to introduce the concept of Hot Wings to the Irondale area, and have since grown from our Eastwood location to serve the Irondale and Birmingham metro areas with our famous Wings. One Wing at a time and a bunch more to come!! A-Wings draws enthusiastic fans from all over the city and state, for that matter. In addition to our Wings, we also have a full menu of sandwiches and sides, but our customers keep coming back for the Wings. We serve it mild, hot or extra hot, bbq and lemon pepper; with plenty of the house blue cheese or ranch dressing, and celery are provided as well. 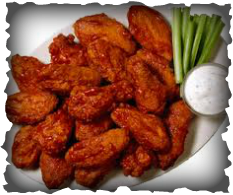 A-Wings also cater and provides large party trays of hot wings for parties, corporate events and more.